VIP and General Admission tickets are still available (must be 21 or older). 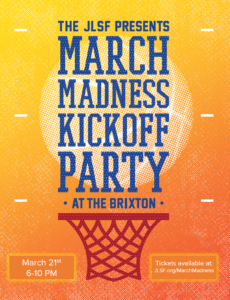 Join the Junior League of San Francisco for a fun night cheering your favorite NCAA basketball teams with friends! Enjoy a high-end silent auction with amazing packages, listen to music by our awesome DJ, purchase drinks and delicious food, and so much more. Invite your friends to our party and support your local Junior League with your ticket and prize pull purchases. A percentage of the evening’s revenue will benefit the JLSF to help us make an impact in our local community. See you at The Brixton!